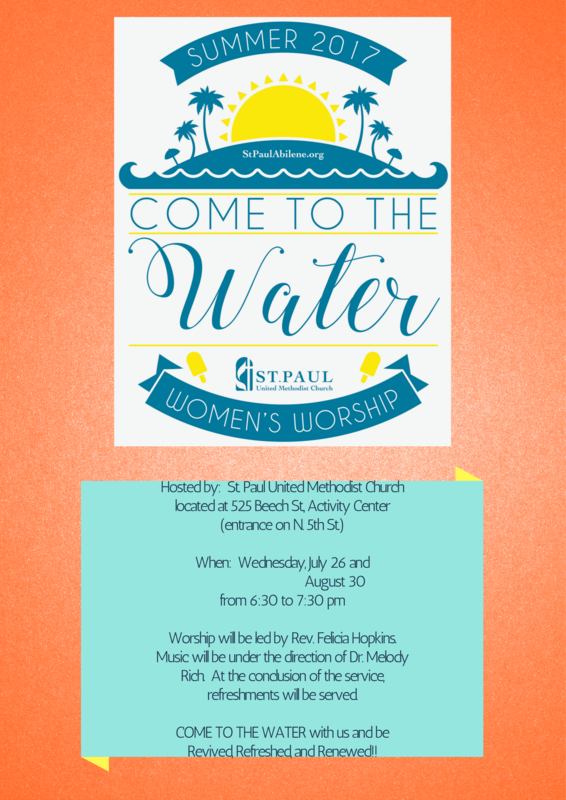 If you missed St. Paul’s Women’s Worship in June, you won’t want to miss out in July! It was an amazing spiritual blessing to those in attendance. Therefore, we want to cordially invite women of all ages and religious affiliations to another amazing faith and community building opportunity – COME TO THE WATER. When: Wednesday, July 26, and August 30 from 6:30 to 7:30 pm. Worship will be led by Rev. Felicia Hopkins. Music will be under the direction of Dr. Melody Rich. At the conclusion of the service, refreshments will be served. COME TO THE WATER with us and be revived, refreshed, cleansed and loved! For more details, please contact St. Paul United Methodist Church at 325.672.7814.